If you’re like me, you like to start your class time with as much peace as possible. 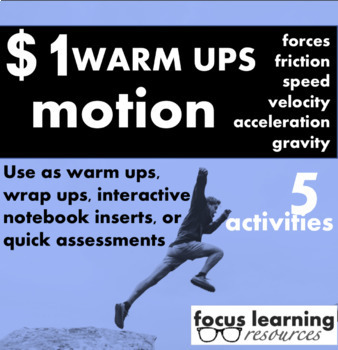 Those first ten minutes of class time can set the tone for the whole next hour; and for you, the rest of day! I learned that if I had a plan (and set those expectations at the beginning of the school year), and the students had something engaging to do, my class time started off well. 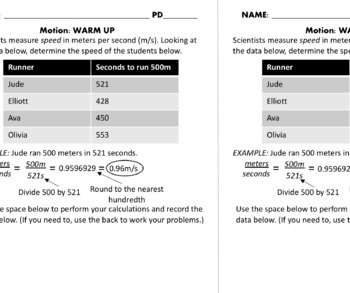 I hope these warm ups help you plan a little bit less and give you the peace (and time to take attendance!) that you deserve. 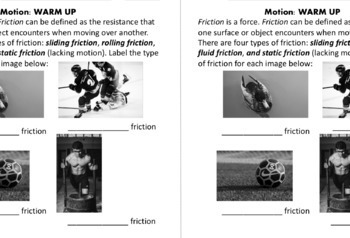 Included are five short activities that introduce concepts such as friction, gravity, speed, and acceleration. They are printed out 2 per page on landscape to save paper andas an optional interactive notebook insert. 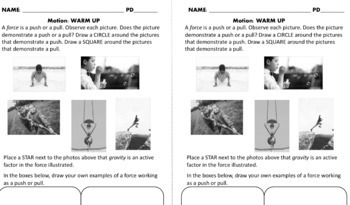 These warm ups can also be used as a “Wrap Up” or “Ticket Out the Door.” After introducing the corresponding material, give students the last ten minutes of class to work on these on their own, and turn them in as they leave. Looking over your student’s work will give you a good idea of what your students took away from your classroom that day.